Homemade Chaat Masala Recipe is one of the quintessential Indian Masala recipe that you could make for yourself within minutes and store for along time. This comes in handy in making a lot of Indian dishes. Here is a video recipe of how to make Chat Masala at home. Indian cuisine seems incomplete without a dash of masalas or handcrafted spices as we all say these days. Be it for sabzis, beverages, cold drinks or rice, masalas add that much needed spice in our lives, ain’t I right, ladies? Though it is a convenient option to buy your favourite masalas from supermarkets, somehow, I cannot trust the quality and the authenticity of ready-made masalas. Hence, I always make sure to prepare the masalas at home. For instance, since the day I have prepared Achari Masala, Thandai Masala Powder, Bisi Bele Bhat Masala Powder, I have completely given up on buying them ready-made because the taste that these homemade masalas grant is totally different and much more satiating the former ones. Inspired by my previous attempts, last weekend, I tried my hands on Homemade Chaat Masala Recipe. Making it at home is super easy and requires basic ingredients which are usually available in the pantry. What is Chaat Masala (Chat Masala)? Chaat Masala or Chat Masala is a spice mix from the Indian cuisine and is a mix of tangy and spicy flavours. It is sprinkled over Chaat and other street food and adds to their taste. It can practically be used with any dish that you feel like perking up. Right from fruit salad, masala toast sandwich, chaat, I tend to sprinkle this magical masala on most of the snacks that I prepare! Homemade Chaat Masala Recipe is thereby, one of the quintessential ingredients that you could make for yourself within minutes and it could be stored for quite some time as well. Fused with the flavours of cumin, whole coriander seed, black peppercorn, hing, dry mango powder, and black salt, this recipe just jazzes up the palate like no one else. To make Chaat Masala Powder at home, you will need some basic ingredients which are easily available at home. You will need cumin seeds, coriander seeds, black peppercorns, hing, amchoor powder and black salt. You can source all these ingredients from any Indian grocery store very easily or can order them online too. How to make Chaat Masala? Making chaat masala at home is quite easy. All you have to do is dry roast cumin seeds and coriander seeds until browned and then grind them with other ingredients to make a fine powder. You will need a good food processor to grind the ingredients to make a fine powder. A coffee grinder will work as well. What are the use of Chaat Masala? Chaat Masala is a blend of spicy and tangy spices and it can be used to perk up any dish. Sprinkle a little over your curries, salad or chaat, it will take the taste a notch higher. I also like to add it in my dry sabzi in place of dry mango powder. I also sprinkle it over Indian Dry Snacks like Namak Pare, Cornflakes Chivda, Masala Kaju, Peanut Masala etc. It is also added in drinks like Jaljeera or Shikanji. Chat Masala vs Garam Masala? 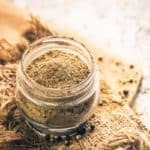 These two are totally different masalas and their uses are also very different.While garam masala is made using warm spices like cardamom, cloves, cinnamon etc, Chaat Masala is a mix of mix of spices and dry mango powder. Garam masala is mainly is used to enhance the aroma and flavour of the dish and is mainly added in curries, while Chaat Masala is added to enhance the flavour of the dish and make them more tangy. How long can you store Chaat Masala? Chaat Masala can be stored for up to 2-3 months in a glass jar. Keep it in a cool and dry place. Homemade Chaat Masala Recipe is one of the quintessential Indian Masala recipe that you could make for yourself within minutes and store for along time. This comes in handy in making a lot of Indian dishes. Here is how to make it. Heat a frying pan and dry roast cumin and coriander seeds until fragrant. Add them in a blender along with black peppercorn and grind to make a smooth powder. Add hing, dry mango powder, black salt and salt in the mixture and mix well. Store in a glass jar for 1-2 months. Please mention the capacity of cup used for measuring ingredients. This is standard cup measurement. You can use plain salt.